I maybe in the minority when I say this, but I was not a big fan of the original ATV Offroad Fury game. I was not a big fan of the gameplay or the graphics. One of the first things that appealed to me about playing ATV Offroad Fury 2 was the online play. Naturally I am a huge fan of online gaming whether it’s taking down guys in SOCOM or Black Hawk Down or crushing someone with my unstoppable defense in Madden 2003. 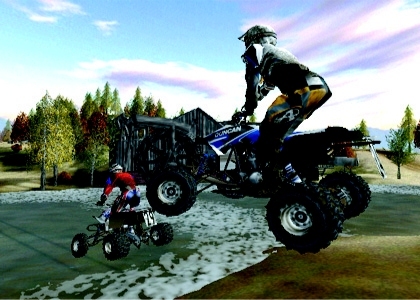 ATV Offroad Fury 2 is one of Sony’s first online games for the PS2 with the exception of NFL Gameday 2003 and Twisted Metal Black Online. Does Sony’s sequel deliver? The graphics are solid and much better than the original ATV Offroad Fury, but they are nothing great. The environments are nicely detailed and the water effects and mud effects are nicely done. 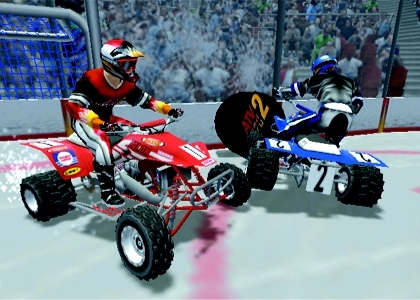 Although the player models could use some work and the graphics in the online multiplayer do tend to take some hits using a dial up connection. The loading times can also be a little lengthy. You win some you lose some if you have an analog connection and a network adapter. 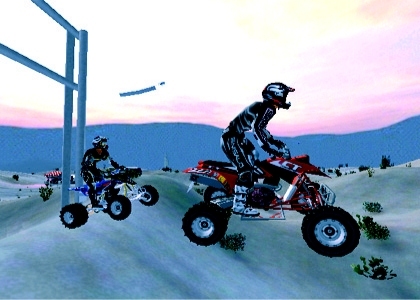 The sequel to the original ATV Offroad Fury game features a killer sound track with bands such as Korn, Garbage, Filter, Alien Ant Farm Cypress Hill and System of a Down filling out the games impressive soundtrack. The in game sounds are nicely done as well. The ATV’s sound good and there is a perfect balance between the in game music and in game sounds as well. Overall in the sound department you get a great package. One of the first things with ATV Offroad Fury 2 that drew my attention was the robust amount of game modes the game offers. It’s astounding; at how much the game offers along with the online mode itself. Not only that but the game also has forty massive environments, which you can race on. There are fourteen different types of championships in the single player mode itself, which is very impressive. The amount of multiplayer modes the game includes in unbelievable (excluding online play). Different game modes include hockey, racing, freestyle, treasure hunt and king of the hill. The game also includes online play for both analog (dial up) and broadband play. The online play for analog sadly only supports two players and for broadband play supports only four players. Not only that, but ATV 2 also support I-link and LAN play as well. Online play has been successful on the Playstation 2 thanks to a great library of games such as SOCOM, Tribes Aerial Assault, Madden 2003, NBA Live 2003 and NBA 2k3 just to name a few. For those who are interested only in the online play will sadly be disappointed. Most games on the Playstation 2 run fine with a dial up connection, but ATV 2 is a different story. The game tends to lag frequently and the game even tends to lag when you are hosting. Sony implemented a system where the broadband and narrowband players are in separate rooms from each other. One big problem you may encounter with a dial up connection is if you are in a race and are in first, then all of a sudden you’ll see your opponent ahead of you in a few seconds. To add insult to injury for the online play there is only two game modes, which are race and freestyle. One of the most annoying things about ATV’s online mode is the fact that once you enter the online lobbies you cannot log off or go back to the game’s normal menus without shutting off or resetting your console. It does get quite annoying and silly for those who spend lots of their time switching back between the games online mode. The only enjoyable way to play ATV 2 online is through a broadband connection. Thankfully, since the online mode doesn’t live up to the expectations the offline modes deliver in a big way. The single player modes and multiplayer modes are a blast to play, but a few minor problems does hinder the both modes. The computer AI first of all is too good and rarely makes a mistake. There might be the odd time where they don’t pull off a trick or they crash into something, but for the most part they are extremely good even on the easiest mode. You will rarely ever beat the computer badly and all of the races are close finishes. There are two modes of difficulty, which are normal and difficult. The other problem is some of the tracks in the single player and multiplayer mode. Some tracks appear to have shortcuts, but if you take the shortcuts it drops you in position quickly and the arrow which shows you which direction to travel in is not precise enough at times. Also another problem is landing tricks at times. In some levels hills often repeat themselves one after the other and since you can almost never land jumps on hills the hills are pretty much useless sometimes. There are only three words to describe most of the game’s controls, which are simple, precise and responsive. The games controls are just perfect and are some of the best I have played with in any racing title out on any console. For this reason the game is easy to pick up and play for beginners or even for those who are not big fans of racing games. One area where it does get a little tricky is executing some of the more impressive tricks. One annoying thing I have with the controls is the reverse function. In most racing games reverse is often the triangle button, but in ATV 2 the reverse button is square plus the X button at the same time. It does get quite annoying and it makes you think why they made this decision. While the online mode probably won’t dazzle anyone like other online games have on the Playstation 2, ATV 2 will surely bring fans back for more with what it has to offer in the offline department. The almost infinite amount of game modes, courses, and options will leave most playing this one for a while. The online mode is an average alternative for those who don’t have any friends over and wish to play against human opponents. While ATV Offroad Fury was a disappointment to me, the sequel sure wasn’t and it delivers in a big way. Even those who don’t have a network adapter have a perfectly good reason to pick this title up, while those who have a network adapter will have a little more fun for your money, but not too much more fun. Even with ATV 2 small amount of problems the game is a must have for any racing fan or any fan of the original ATV Offroad Fury game.